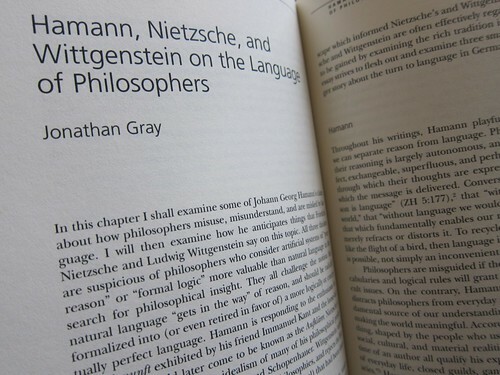 I’ve got a chapter on “Hamann, Nietzsche, and Wittgenstein on the Language of Philosophers” in Hamann and the Tradition , which has just been published by Northwestern University Press. The book is based on a series of papers given at an international conference on Hamann in New York in March 2009. It is edited by Lisa Marie Anderson, who organised the conference and also translated Hegel’s essay on Hamann . I’ve uploaded a post-print version of the chapter to the institutional repository of Royal Holloway, University of London. You can download a PDF copy here. It is listed on PhilPapers here. In this chapter I shall examine some of Johann Georg Hamann’s claims about how philosophers misuse, misunderstand, and are misled by language. I will then examine how he anticipates things that Friedrich Nietzsche and Ludwig Wittgenstein say on this topic. All three thinkers are suspicious of philosophers who consider artificial systems of “pure reason” or “formal logic” more valuable than natural language in the search for philosophical insight. They all challenge the notion that natural language “gets in the way” of reason, and should be radically formalized into (or even retired in favor of) a more logically or conceptually perfect language. Hamann is responding to the enthusiasm for reine Vernunft exhibited by his friend Immanuel Kant and the loose-knit group that would later come to be known as the Aufklärer. Nietzsche is profoundly critical of the idealism of many of his philosophical predecessors, including Kant, Hegel, and Schopenhauer. Wittgenstein turns away from Frege’s and Russell’s logical philosophies, and rejects the British idealism (deeply influenced by Kant and Hegel) that had been dominant in earlier decades. Hamann, Nietzsche, and Wittgenstein all contend that reason and logic come from and are dependent upon natural language, which changes over time, and which responds to the interests and circumstances of its users. They all suggest that philosophers can benefit from a richer and more nuanced awareness of how our concepts and the ways in which we reason are born out of language, which is a complex, dynamic, variegated phenomenon, reflecting the complex, dynamic, variegated nature of human life and behavior. While the extent to which one can trace direct lines of influence from Hamann to Nietzsche to Wittgenstein is debatable, Hamann was an important influence on the post-Kantian German philosophical landscape which informed Nietzsche’s and Wittgenstein’s work. While Nietzsche and Wittgenstein are often effectively regarded as isolates, much is to be gained by examining the rich tradition in which they stand. This essay strives to flesh out and examine three small episodes in a much bigger story about the turn to language in German philosophy. This entry was posted in hamann, herder, history, humanities, intellectualhistory, nietzsche, philosophy, wittgenstein. Bookmark the permalink. Comments are closed, but you can leave a trackback: Trackback URL.